May 31, 2005 the Shiloh world lost a good soul. Cheri Schell, of Schell's Shilohs had a dream. She wanted more than anything, to prove that this breed was perfect for service dog work. 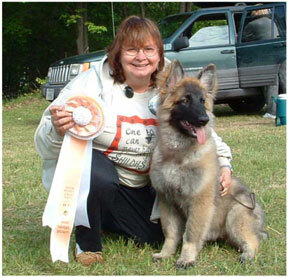 Cheri loved the wonderful temperaments of the Shilohs and she wanted everyone to know and understand that training was a key element to a good dog. Cheri owned two Shiloh girls, Sugarfoot and Maui, she owned Sugarfoot's daughter Breezie and she owned a lovely young male named Hawk. Those dogs, along with all of Cheri's family and friends, are lost without her. 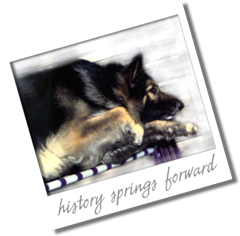 Cheri was fighting a hard battle with cancer and was considered terminal. But I think God loved Cheri so much that He did not want her to suffer, so He took her quickly one day and now has her in Heaven, in charge of all of our Shilohs who have passed. 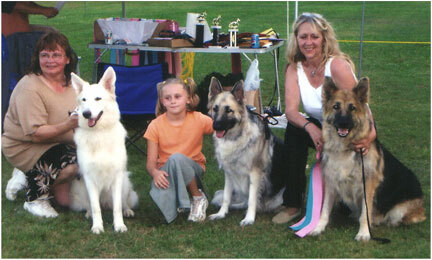 ABOVE: Cheri with Breezie, Cheri's grand daughter with Sugarfoot and Judy with Abi.